HEART Berry College’s time-tested “education of the head, heart and hands” combines intellectual skills and practical skills in a way that shapes people known for their work ethic, character and readiness for the challenges of life. Our demanding academic programs rival those of many of the nation’s finest liberal arts colleges, and our voluntary student work program is the largest and most sophisticated of its type in the nation. We teach responsibility by giving responsibility and seek to graduate engaged citizens who are ready, willing and able to improve their families, workplaces and world. Animal Science at Berry College Best of Breed When schools of veterinary medicine seek strong candidates, many look directly at animal science majors of Berry College. Nearly 90 percent of Berry students applying for admission to these highly select programs typically are accepted, a rate that is twice the national average. From one recent class alone, 16 Berry graduates enrolled in 10 of our nation’s 30 schools of veterinary medicine. Animal science majors pursuing graduate degrees in other fields such as immunology, reproductive physiology and nutrition have experienced equally high rates of success, while dozens have headed directly into productive careers in animal-related industries that include pharmaceuticals, poultry production, work with the U.S. and Georgia departments of agriculture, and management of beef and dairy cattle operations. Fueled by student success, the animal science program has more than tripled in size over the last decade, growing from 75 to approximately 270 students. It is now Berry’s largest major, and many would say it is the most distinctive. This growth has led to opportunities and challenges. Over recent years, we have increased our faculty and enhanced our academic curriculum. We now are poised for the next big step: By providing the type of facilities that expand capacity for students to participate in research and to experience firsthand what they have heard in lectures or read in textbooks, we can take this signature program to the very highest level, offering the kind of animal science education few can get elsewhere as undergraduates. 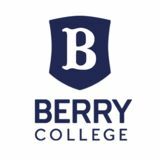 At the same time, we will meet the urgent space needs generated by the program’s growth and success, which are jeopardizing the kind of student/faculty interaction that is Berry’s trademark and promise. Toriâ&#x20AC;&#x2122;s story If hard work is what it takes to get into vet school, Tori Thiessen should be a shoo-in. The Texas native with both academic and leadership scholarships worked in the biology lab as a freshman and now assists with the business end of Berryâ&#x20AC;&#x2122;s animal science and agriculture operations. She also works part time at Mount Berry Animal Hospital and serves as a summer research assistant for Professor George Gallagher, helping to test totally natural and harm-free means of repelling rat snakes and deer, among other projects. In her spare time (spare time?! ), Tori rides English hunt seat for the varsity equestrian team, serves as worship coordinator for Baptist Collegiate Ministries, and has salsa-danced her way into the co-presidency of the Swing and Ballroom Dance Association. Animal science addition to McAllister Hall Berry College has experienced a renaissance in the sciences in the dozen years since the McAllister Hall science center was constructed. A major addition will now bring the animal science program into this exceptional facility, providing high-caliber classrooms and laboratories designed to promote the hands-on learning and student/faculty interaction for which Berry is best known. The new wing also will help facilitate the college’s development of a distinctive emphasis on “One Health,” an emerging area of scientific study involving researchers in biology, biochemistry and animal science. Berry’s expansive setting, with its mix of wildlife and livestock, provides a natural laboratory for investigating the interconnectedness of health in an ecosystem. Josh’s story Josh Moore has known what he wants since the age of 10 when he got a bull for Christmas after selling his horse to buy two Angus cows. He now grazes 45 commercial Angus on 100 acres of rented land and recently purchased a Berry bull to improve his herd’s genetics. He chose Berry because of its hands-on approach to learning and has taken full benefit. In addition to majoring in animal science with a production/management concentration and minor in business administration, Josh has worked his way up to the CEO position for Berry’s Angus Beef student enterprise, strengthening his agricultural education and his passion for the beef industry and gaining “irreplaceable” confidence and business skills. Our planned Animal Science Laboratory at Rollins and Equine Laboratory at Gunby will provide Berry’s first dedicated and controlled-environment facilities for research and hands-on instruction with the large animals that are such an important part of our program. Animal science research focuses on understanding animals and their needs for the ultimate betterment of the animals. Current areas of faculty research include animal reproduction, genetics, nutrition, physiology and behavior, as well as issues related to animal welfare, wildlife damage management, and the interaction of wildlife and livestock. While many research projects already involve students, these facilities will expand capacity and multiply opportunity – for students and our dedicated faculty. Animal Science Laboratory at Rollins ■■■■ The Animal Science Laboratory at the Rollins Complex, which has been funded by donors and soon will become a reality, will have the size and flexibility required for safely working with animals that range in size from bulls to poultry. Highlights include: • L arge holding area with fixed stanchions and equipment for work with up to 10 head of cattle • L arge open space with flexible configuration for use with a wide variety of smaller animals • Research laboratory for preparation of samples • L arge storage room for holding materials required for specific studies • Secure veterinary-medicine storage room Equine Laboratory The Equine Laboratory at Gunby will be designed and equipped specifically for the study and care of horses. Like its sister facility at Rollins, it will facilitate handson research opportunities for our students and faculty. Please join us! At Berry College, we ask our students to do their best. They deserve the best from us. That means providing the kind of places and spaces that spur student achievement â&#x20AC;&#x201C; facilities that help our students reach higher and see farther. 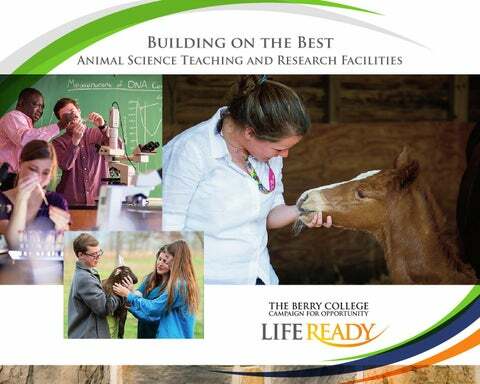 New animal science facilities are a major component in an over-arching LifeReady Campaign focused on preparing Berry College students to graduate ready, willing and able to improve their families, workplaces and world. Support for the animal science program represents support for an already stellar program with exceptional, proven LifeReady results. We hope you will join us! For more information, please contact Scott Breithaupt, assistant vice president for campaign and leadership giving, at sbreithaupt@berry.edu or 706-238-5897.